At Double R Performance, customer service and ultimately, customer satisfaction is our number one objective. 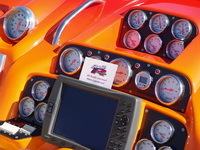 We are your ultimate hi-performance boating solution. From picking up your boat and transporting back to our facility, performing the required service, detailing and delivering your boat to your next event; we handle it all. Service is the reason Raymond Roberts founded Double R Performance back in 1999. It is the unmatched quality of service that has made Double R Performance grow into the company it is today.